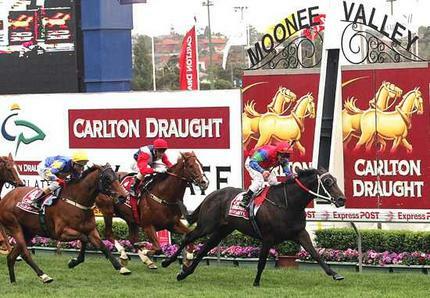 Moonee Valley racecourse is 6 km's from Melbourne. It is situated at Moonee Ponds which is a suburb of the City of Moonee Valley. The track is constructed of the StrathAyr Turf System, having a lower layer of sand and an upper rootzone layer reinforced with mesh elements. Racing takes place in an anti-clockwise direction, as it does on all Victorian tracks. Moonee Valleys most famous race is the Cox Plate. Moonee Valley is an extremely tight racecourse, its circumference is only 1805 metres and horses apper to be constantly on the turn. Add to this the fact that the straight is only 173 metres by far the smallest of any Metropolitan racecourse in Australia, and you will realise why the track is a front runners dream, and the barrier bias can be quite severe. Its not uncommon to see race after race won by a horse in an inside barrier breaking fast and making all. There is a run of 400 metres to the turn, horses then seem to be running on the turn for an eternity until the very short straight. It is a significant advantage to have an inside barrier for fast starting horses. The bend that they run round for the 1200 metere races is not quite as tight as the 1000 metre races, none the less there is only 350 metres till the the bend and it is still a significant advantage to have an inside barrier for fast starting horses. They start on the course proper rather than a chute for this distance. Horses in inside barriers do still hold an advantage, although it is not as significant as over shorter distances. There is only 200 metres to the first turn and therefore inside barriers have a significant advantage. Over this long distance and with a 400 metre run to the first turn, barrier advantage is very small with inside only slightly favoured. Inside barriers have a very slight advantage round the tight course, although over this distance the advantage isn't significant.